EyePack is an all-natural tear stain removal system for dogs that is designed to effectively reduce both the causes and symptoms of this common, chronic condition. The EyePack combines two effective antibiotic-free products; gentle cleansing pads to safely cleanse the eye area and a nutritional, dietary supplement to boost your dog&apos;s immune system and eradicate the bacteria that lead to yeast infections and excessive tearing and discoloration.
" Red yeast" is a Common Cause of Tear Stains. The EyePack combines two effective antibiotic-free products; gentle cleansing pads to safely cleanse the eye area and a nutritional, dietary supplement to boost your dog&apos;s immune system and eradicate the bacteria that lead to yeast infections and excessive tearing and discoloration. 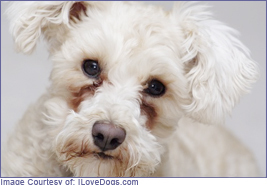 Tear or face staining is a common, but by no means normal, condition that affects many dog breeds and tends to be more noticeable in dogs with white coats or faces. The underlying causes of this condition indicate a deeper, systemic problem which may be both genetic and dietary in nature. Excessive moisture around the eyes is absorbed by facial hair which can remain damp and produce an effective breeding ground for the growth of bacteria and yeast. " Red yeast" is the most common culprit, frequently causing brownish-red facial stains which are sometimes accompanied by a moderate but unpleasant odor. Medical treatments for this problem sometimes include the administering of oral antibiotics, removal of the small hairs around the eyes, and in extreme cases, tear duct surgery may be recommended. The EyePack offers a dietary alternative to this approach by focusing on boosting your dog&apos;s overall immune system naturally to discourage the proliferation of unwanted bacteria and yeast without the use of pharmaceutical antibiotics. Each EyePack comes with a package of hypo-allergenic eye pads that are infused with herbs and botanicals to gently clean away unsightly stains and inhibit the growth of the bacteria that cause them. The Eyemunity powder contains: Epicor, Exylyme Pet (a proprietary blend of Pratease, bromelain, papain, Peptizyme SP, Amylase, Lipase, Rutin and Amla), Andrographis Extract, Vitamin C (Calcium Ascorbate), Astragalus, Cats Claw, Dessicated Liver and Natural Beef Flavor. STEP ONE: Simply remove a pre-moistened pad and wipe both with and against the grain of the fur for maximum effect. 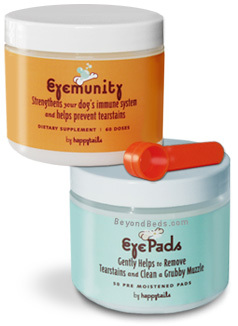 The soothing EyePack pads are safe and gentle enough for puppies as well as older dogs. STEP TWO: Mix or sprinkle the nutrient-rich Eyemunity powder on your dog&apos;s food every day. This delicious, all-natural dietary supplement contains Epicor, a high-metabolite immunogen that contains three-times the anti-oxidant power of any known fruit and has been clinically proven to boost immunity in both animals and people, as well as a host of other beneficial herbs and botanicals. Free of pharmaceutical antibiotics, this delicious formula is gentle on your dog&apos;s digestive system and will eliminate the bacteria that causes tear staining as well as improve his overall health and immune system over time. EyePack eyepads are soaked in a solution that contains the following ingredients: Witch Hazel (Hamamelis Virginiana), Colloidal Silver, Cocamidopropyl Betaine, Golden Seal (Gydrastis Canadenis), Eyebright (Euphrasia Officinalis), Rosemary Leaf (Rosmarinus Officinalis) Extract, Raspberry Fruit (Rubus Idaeus) Extract, Raspberry Fruit (Rubus Idaeus) Extract, Echinacea Angustifolia Extract, Glycerin, Citric Acid, Potassium Sorbate and Lavendar Flower. Note: Although originally developed for dogs, the EyePack tear stain removal system also works safely and effectively on cats.